* Note: In 2010 the values are obtained by adding Chase and Morgan Stanley's values. The above table only includes banks chartered in the U.S. 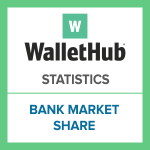 The top 15 banks make up over one half (53%) of the deposits for all banks in the US. The top 5 institutions make up nearly half (46.8%) of the total bank assets in the US.